The GPI M-3120-AD with 1-inch outlet heavy duty transfer pump uses a rotary vane design and is made from durable cast iron. The 115-volt motor delivers flow rates up to 20 GPM. 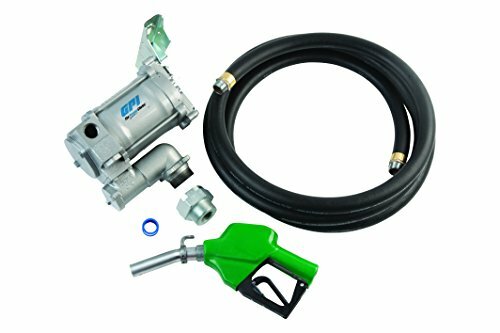 The GPI M-3120 series is the pump of choice for heavy equipment applications and is ideal for use with stationary tanks dispensing diesel, gasoline and kerosene. The GPI M-3120-AD comes with hose and automatic leaded nozzle. U.L. listed to U.S. and Canadian standards & 2 year warranty. High flow rate reduces time spent refueling equipment. Temperature limiting motor protection extends pump life. External switch cover plate allows for easy access and keeps the UL rating intact. Weight centering inlet base reduces tank stress includes pressure relief valve and provides easy strainer access. Field replaceable switch and vanes. Durable Cast Iron Housing. Includes 1-inch automatic leaded nozzle, 1-inch x 12-foot UL dispensing hose, lockable nozzle holder and weight centering base. For use with diesel fuel (bio-diesel blends up to B20), gasoline (gasohol up to E15) and kerosene. U.L. listed to U.S. and Canadian standards & 2 year warranty. View More In Rotary Vane Pumps. If you have any questions about this product by GPI® The Proven Choice®, contact us by completing and submitting the form below. If you are looking for a specif part number, please include it with your message. Link V-Belt Wedge Belt 3V 100 ft.